Task: In the situation of unprecedented attack against the progressive entrepreneur maintain Mr. Khodorkovsky's positive image; disseminate objective news and facts about the case; create wide community-minded base of support all over the world. 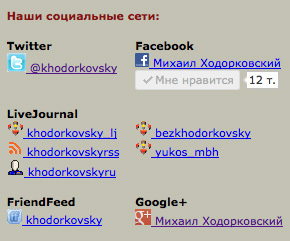 Strategy and tactics: Active engagement of supporters via www.khodorkovsky.ru forum and later major social networks, including Facebook, LiveJournal, Twitter and Google+. 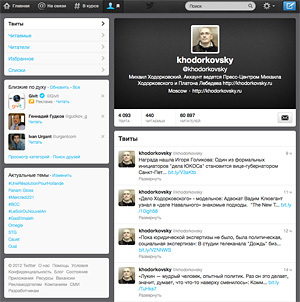 Utilise the means of the social media to spread Khodorkovsky and his team's key messages; facilitate sharing of news, opinion and support initiatives between society members; maintain active dialogue with the public; share important and interesting articles, interviews, facts; engage public in support activities. 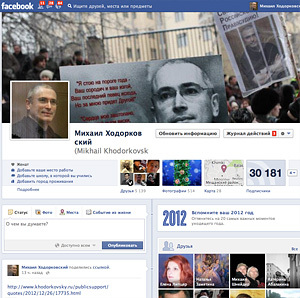 Result: Active social community, 30 000 friends and 15000 subscribers on Facebook, more than 68000 followers on Twitter. From less than 10% in 2003 Mr. Khodorkovsky's support base rose up to 33% of the whole Russian populations (according to Levada-centre independent analytical centre) in 2013.